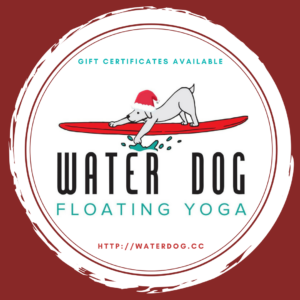 Water Dog is excited to continue its Paddleboard and DECK classes through the Holiday Season when we may need it most! 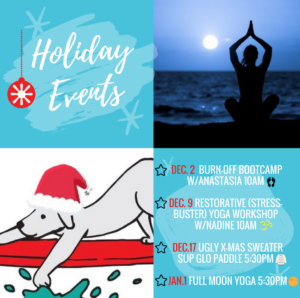 Yoga and exercise not only help us deal with the stress of the holidays, but also help us be able to enjoy the extra food and drink! Our December schedule is attached and can be viewed in the “Calendar” section of our website. We will be holding classes during the week of Christmas and on New Year’s Day. 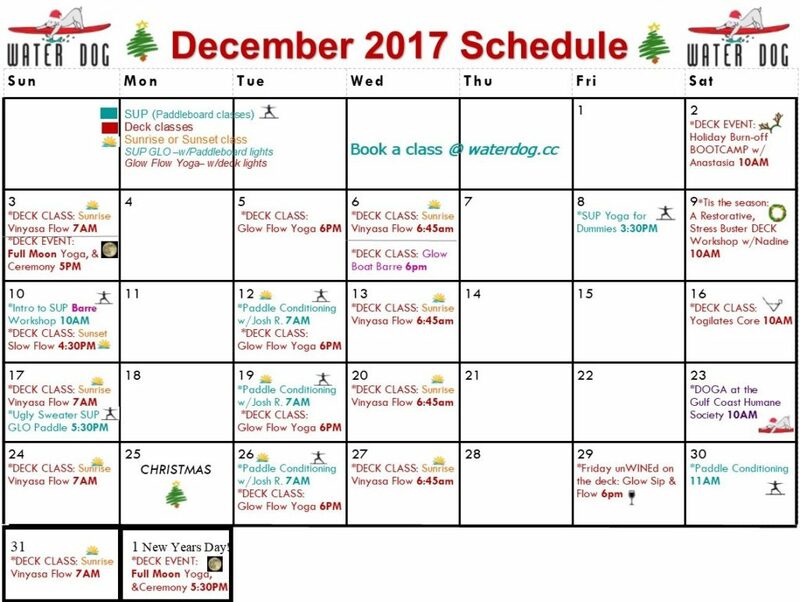 *NOTE* Water Dog will be closed for about ten days shortly after the New Year from January 5-15th, then we will start up again will regular deck and SUP classes. 3- Dec. 17: SUP Glow Paddle – Wear your Ugly Holiday Sweater! 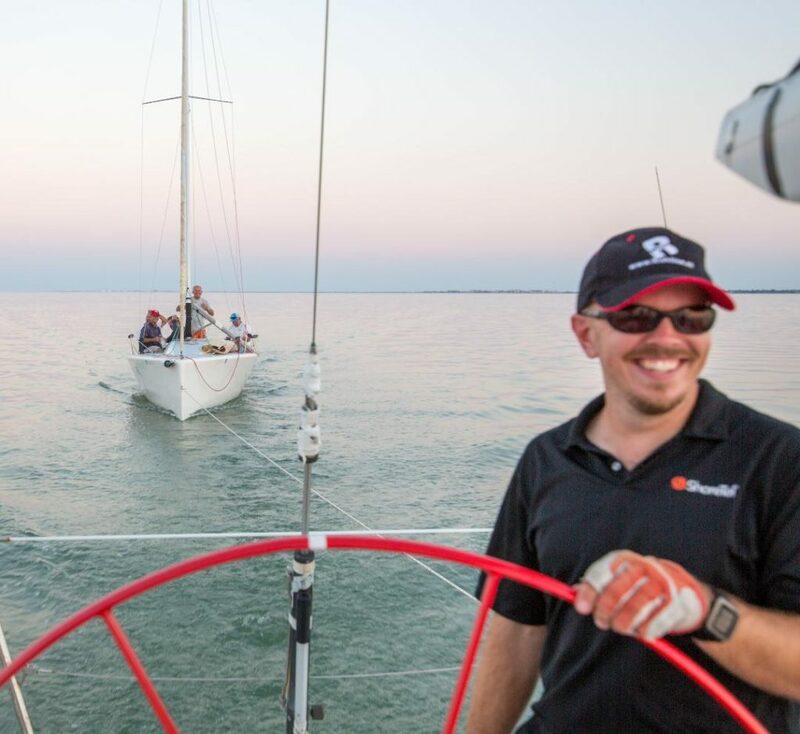 For this special class we will paddle around the marina and inside the protected waters and lights of the bay for a night paddle and tour. We will start this class just as the sun sets. 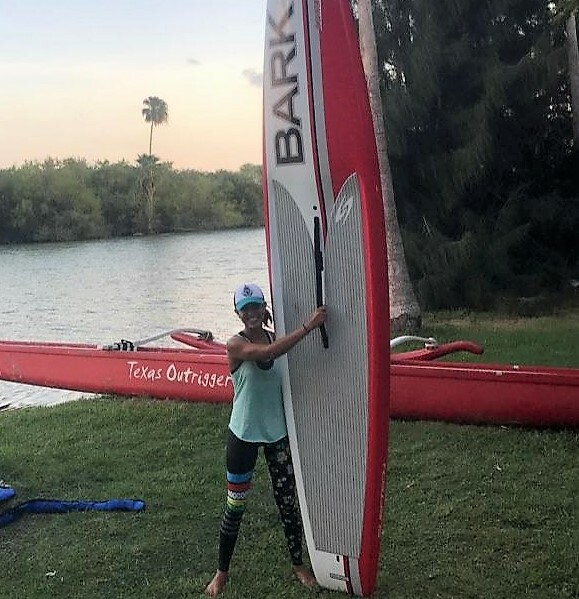 Each paddler will have the use of an inflatable, water proof light to place on their boards and SUP GLO lights for underneath their paddleboards. ***Wear an Ugly holiday sweater and the person with the ugliest sweater will receive a prize!! What a great way to start 2018! Enjoy the meditative qualities of the moon, the wind and the waves at Water Dog Floating Yoga. 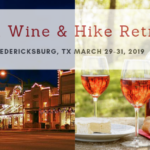 Calming blue lights on the deck will guide you during this gentle yoga flow that will include moon salutations, in honor of the moon and its energies, along with a short meditation and a special Full Moon Ceremony with take home ceremony gifts and light refreshments. Like all of Water Dog’s class this is all levels–modified for beginner to advanced. What is SUP Barre?! 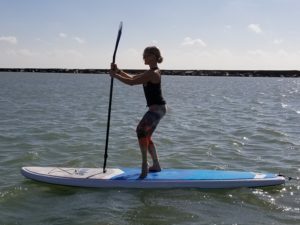 It’s one of the newest forms of SUP Fitness that Water Dog is bringing to Corpus Christi. This Intro Style Workshop Event will be lead by Pilates & Barre instructor Heather McVay on Sunday, December 10th at 10am. 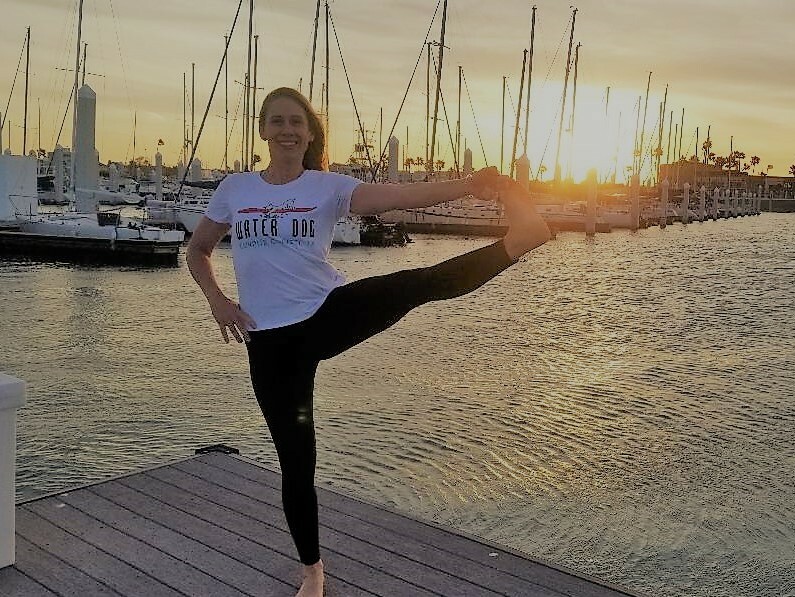 The workshop is designed with modifications to make beginners feel comfortable on the boards–even if they have never done SUP or Barre before!. 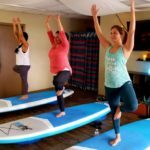 If SUP isn’t for you, check out Heather’s “Glow Boat Barre” class on Wednesday, December 6th at 6pm. 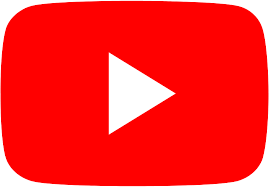 This class is also included in a regular deck class package. 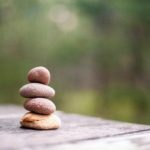 Full Moon: December 3, 2017 & January 1, 2018! The Full Moon events have been very popular at Water Dog and they often fill up. These events include a gentle yoga class with moon salutations in honor of the full moon. 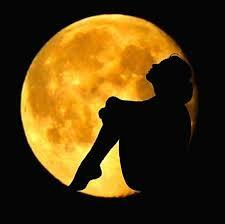 Then we perform a short meditation and finally we finish with a Full Moon Ceremony. As part of the ceremony, each yogi will receive a Full Moon gift bag with items for the ceremony along with some light refreshments. December’s Full Moon falls on Sunday the 3rd and it will start at 5pm. Prepare to watch a beautiful sun set before viewing the full moon! The following Full Moon will be January 1st: *NEW YEAR’S DAY*!! What a great way to start the first day of 2018, setting your goals and intentions along with absorbing the positive energy of the Full Moon! We offer Prepaid Packages for classes on the floating deck. 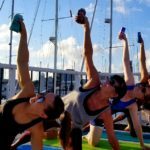 The package is good for 6 months and for any regular 60min deck class, including: Sunrise Vinyasa Flow, Sunset Slow Flow, Glow Flow, Boat Barre, Bootcamp and Yogilates Core. Are you looking for a Holiday gift, but you don’t want to go to the shops?! You can purchase and customize a Water Dog Gift Voucher online that can be printed or emailed. 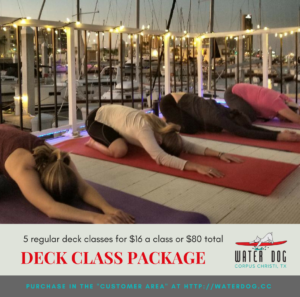 Did you know that Water Dog also offers private, semi-private and private group lessons or events on the Deck and on the Paddleboards?! We are winding down our SUP Yoga/SUP Pilates classes during the winter season, but there are still many gorgeous days. Just call to set up a time for a private, semi-private or class with a group of friends. Yogilates combines elements of both Yoga and Mat Pilates. In this deck class we will flow through yoga and Pilates moves, focusing on strengthening the entire core, especially the abs and glutes. 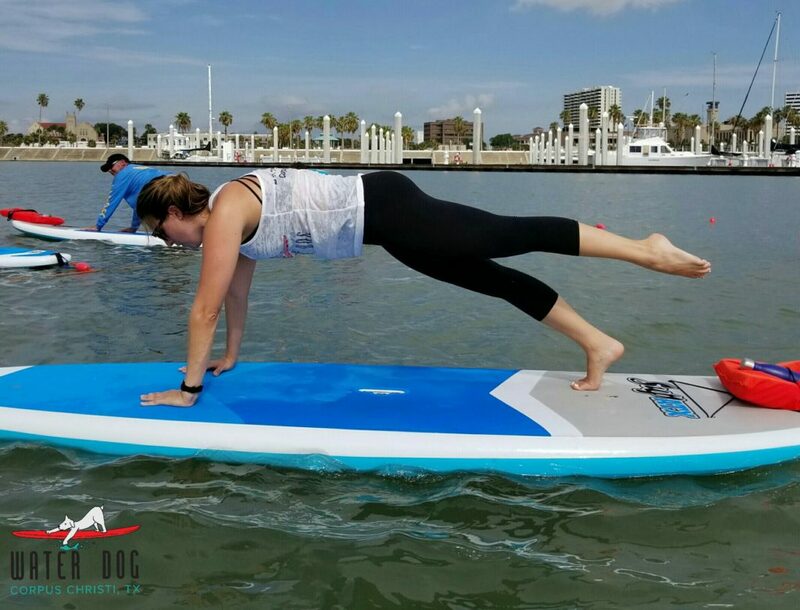 The core is essential in yoga, Pilates, fitness and especially on the paddle boards! A strong core will help you hold poses longer, achieve proper posture and improve your balance. It can also prevent injuries and lower back pain and it will leave you feeling and looking amazing! Like most of Water Dog’s classes this will be for all levels with modifications for beginners to advanced levels. *This class will be held on Saturday December 16th at 10AM and it is included in a regular deck class package. 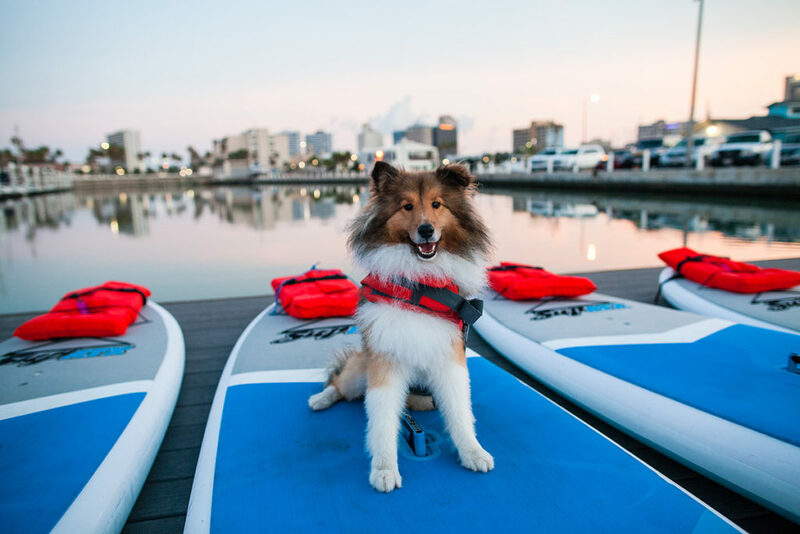 As the weather gets colder Water Dog will continue to hold deck and paddle classes as long as Corpus Christians and visitors are willing to face the chillier temperate in order to spend some time outdoors on the water. We just came off of a super hot summer and we are all ready for the cooler temperatures. So put on a few extra layers and come enjoy a bit brisker weather. Dress in layers. It may be cold at the start and end of a class, but you will be creating some internal heat and may need to shed a few layers during your workout. You may want to bring an extra long-sleeve or jacket just so you are comfortable during your class. We also have warm Mexican Blankets at our studio for savasana or evening during class. Classes are done in bare feet, but if you have socks with grippy soles that can work too! We will hold less SUP classes, but for the ones we do hold, you may want to bring a waterproof jacket or even fleece lined leggings! If a class is going to be too cold or have otherwise inclimate weather, we will notify those signed up and cancel the class as appropriate.